PDF Data Merge is an online utility that merges your spreadsheet data into a PDF. Simply provide a fillable PDF template and a spreadsheet. Let PDF Data Merge take care of the rest. Works with Safari, Chrome, Firefox, and Internet Explorer, among other browsers. Available whether you are at the office or on the go, if you have a PDF file and spreadsheet (and an Internet connection), this utility can convert your files without additional PDF software. You can receive all of your generated PDFs as a single large PDF file (for easy printing), or in a ZIP file with individualized PDFs (for easy archival). Whether your users are on Windows, Mac, or Linux, this utility will allow them to generate PDFs that work across platforms. Supports Excel (*.xls, *.xlsx), Libre/OpenOffice, and CSV spreadsheets. Simple 4-step process that produces great results! 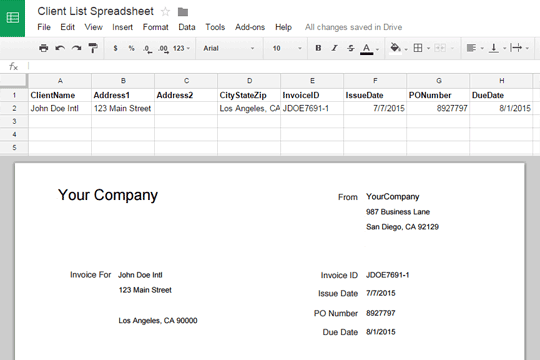 Provide a fillable PDF and spreadsheet with matching fields. View preview of output and confirm submission. Once submitted, your files will be queued into the system for processing. Your screen will provide the latest updates on the progress of your request. When your files are ready, a download button appears allowing you to retrieve your files. Sign up using the form above to be notified of the latest features and updates! If you have any additional questions, please ask via our Contact Us form. © Copyright 2019 by SolidCoding. All Rights Reserved.